Southern Sami is 1 on this map. 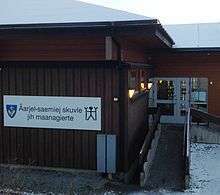 Åarjel-saemiej skuvle (Southern Sami school) and maanagierte (kindergarten) in Snåsa. Southern Sami (Åarjelsaemien gïele) is the southwestern-most of the Sami languages. It is a seriously endangered language; the strongholds of this language are the municipalities of Snåsa, Røyrvik, Røros and Hattfjelldal in Norway. 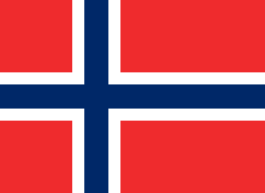 Southern Sami is one of the six Sami languages that has an official written language, but only a few books have been published for the language, one of which is a good-size Southern Sami–Norwegian dictionary. An alternative orthography replaces Æ/æ with Ä/ä and Ø/ø with Ö/ö. The variants Ä/ä, Ö/ö are used in Sweden, Æ/æ, Ø/ø in Norway, in accordance with the usage in Swedish and Norwegian, based on computer or typewriter availability. The Ï/ï represents a back version of I/i, many texts do not distinguish between the two. C/c, Q/q, W/w, X/x, Z/z are used in words of foreign origin. Southern Sami has two dialects, the northern and the southern dialect. The phonological differences between the dialects are relatively small; the phonemic system of the northern dialect is explained below. 1The distinction between the vowels /i/ and /ɨ/ is normally not indicated in spelling: both of these sounds are written with the letter i. However, dictionaries and other linguistically precise sources use the character ï for the latter vowel. 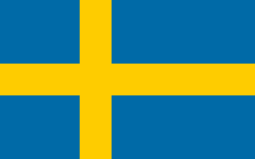 2The letter æ is used in Norway, and ä in Sweden. 3Long /ɛː/ is written ae. The non-high vowels /e/, /ɛ/, /o/ and /ɑ/ contrast in length: they may occur as both short and long. High vowels only occur as short. On the other hand, Southern Sami is the only Sami language that does not have consonant gradation. Hence consonants in the middle of words never alternate in Southern Sami, even though such alternations are frequent in other Sami languages. Compare, for instance, Southern Sami nomme 'name' : nommesne 'in the name' to Northern Sami namma : namas, with the consonant gradation mm : m.
Southern Sámi is one of the few Sami languages that still differentiate between the accusative and the genitive morphologically. Southern Sami, like Finnish, the other Sámi languages and Estonian, has a negative verb. In Southern Sami, the negative verb conjugates according to tense (past and non-past), mood (indicative and imperative), person (1st, 2nd and 3rd) and number (singular, dual and plural). This differs from some other Sami languages, e.g. from Northern Sami, which do not conjugate according to tense. Like Skolt Sami and unlike other Sami languages, Southern Sami is an SOV language. ↑ "To which languages does the Charter apply?". European Charter for Regional or Minority Languages. Council of Europe. p. 5. Retrieved 2014-04-03. ↑ Hammarström, Harald; Forkel, Robert; Haspelmath, Martin; Bank, Sebastian, eds. (2016). "Southern Sami". Glottolog 2.7. Jena: Max Planck Institute for the Science of Human History. Bergsland, Knut. Røroslappisk grammatikk, 1946. Knut Bergsland. Sydsamisk grammatikk, 1982. Knut Bergsland and Lajla Mattson Magga. Åarjelsaemien-daaroen baakoegærja, 1993. Wikimedia Commons has media related to Southern Sami language. Sámi lottit Names of birds found in Sápmi in a number of languages, including Skolt Sámi and English. Search function only works with Finnish input though.